The following clothing recommendations are pulled together from an earlier Facebook thread as well as posts from the 2008 Gathering. Because Scotland rains a lot (repeat, a LOT), we need to be prepared for the weather if we want to enjoy ourselves. As a general rule, you should try to get water-resistant/waterproof items that are described as breathable, or you run the risk of being uncomfortable regardless of the weather. Water-resistant trail shoes – fancy tennis shoes that are designed for stability when walking on uneven ground. Although perhaps not the best for hiking (see next item), they should be comfy for daily sightseeing in the rain. Water-resistant hiking boots. Considerably bulkier than trail shoes, they are better than trail shoes for hiking in mud, a real possibility. Because they are so bulky, we might want to wear them on the plane rather than packing them. Wellies. Alison says wellies are popular in Scotland, because when it rains, and the ground is soaked, and even water-resistant Goretex trail shoes suffer quite badly. Socks. Wool is always best for warmth, moisture-wicking, and blister-free hiking. Smartwool is a great brand, though expensive. Lightweight, water-resistant/waterproof/wind-resistant pants to pull on over your regular pants in bad weather. From the 2008 website: “The one thing we would totally advise against is denims, not because of any fashion police but when the get wet they get very heavy and sap the heat out of you at an alarming rate. People have ended up with hypothermia in the Scottish summer when wearing denims and getting wet.” However, denim should be fine if under water-resistant pants. Layers. Shirt/T-shirt/“vest” + sweater/”jumper”/fleece + a lightweight water-resistant jacket with a hood (avoid a heavy lining – you might be wearing it in the rain on a warm day). Choose one long enough cover your longer sweaters and shirts. You might prefer a waterproof hat to a jacket hood. A waterproof backpack for hiking supplies like water, camera, phone, other essentials, and clothing layers that prove unnecessary in the unlikely event that clear weather breaks out. Sunscreen. Yes, hot, sunny weather does happen at times. Insect repellent against midges and cleggs (Scottish flies). Deet is most effective, but it tastes terrible and must be applied to your lips, too, unfortunately. It’s probably best to purchase midge repellent in Scotland. There are various brands, but Colin says that Smidge works well; it’s based on the Bog Myrtle that was used historically. Gregor McIntyre says there are special mesh anti-midge hoods available, too. Clan member Erica Buster-Faubert recommended Sierra Trading Post for affordable gear, and after ordering some of the above from there, Penny highly recommends it, too. Running Warehouse also offers shoes with a full money-back guarantee up to 90 days, even if the shoes have been used. Ardchatten Parish recommended the Ledaig Leisure supply shop that is part of the garage in Benderloch, seven miles north of Oban. 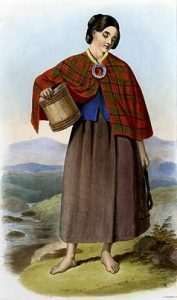 The 2008 Gathering website has a post about clothing, including kilts and formal wear, here http://www.electricscotland.com/webclans/m/macintyre/gathering/clothing.pdf , and other useful information on supplies for hikes here http://www.electricscotland.com/webclans/m/macintyre/glennoewalk.htm , although almost all relevant information has been incorporated on this page and the Indoor Clothing page.